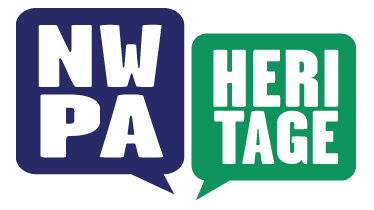 NWPaHeritage is a free app that puts the history of Northwestern Pennsylvania (Crawford and Venango Counties, and the Oil Heritage Region) at your fingertips. Explore unique historic places and take self-guided walking tours. Find interesting people, places and events in NW Pennsylvania history. With a growing list of interpretive stories, each point on the interactive GPS-enabled map includes historical information about the location, along with historic images from archival collections and historical publications . Funding for this project has been provided by The Andrew W. Mellon Grant to Allegheny College for Collaborative Undergraduate Research in the Humanities, the New Initiatives project of the Great Lakes College Association, and the Art Department, Allegheny College. We would also like to acknowledge the support of Jonathan E. Helmreich, Emeritus Professor of History and College Historian, Allegheny College, the Wayne and Sally Merrick Historic Archival Center, Allegheny College, and the Crawford County Historical Society, Meadville, Pennsylvania. Many historical images and other media have been reproduced here with permission from the repositories where they are currently held, using the best information available to us. If you have additional information or believe that we have reproduced this material in error, please contact the NWPa Heritage project.